I’ve really been dropping the ball on these ACTBiPed reports. After missing out on reporting on two, I’m a month late for the September 19, 2018 meeting. Sorry! Here’s the agenda package for the meeting so you can follow along at home. We started off discussing a pedestrian-controlled crossing that will be installed near the corner of Royal Avenue and 11th Street. There’s a lot going on here to unpack. First, it’ll be crossing Royal Avenue, part of TransLink’s Major Road Network and a truck route through New Westminster. It’s at the bottom of a hill, which means that vehicles are moving quickly (67.5 km/h on average in a 50 km/h zone). The vehicles are often heavy trucks which require more distance to stop. All of this means that New Westminster can’t just throw up a traffic light and call it done, there’s coordination with TransLink that needs to happen. That coordination is happening, and TransLink requires an Advance Warning Flasher be installed on the eastbound direction of Royal Avenue. The city is also going to extend the median along Royal Avenue from Columbia Street towards the crossing, and install fencing along the median so pedestrians cannot cross the street except at the crosswalk. Discussion around the table seemed to focus on the fencing as a bunch of people feel that it’s hostile to pedestrians (I’m not included in that group, because I feel that this location is a good spot for such a fence — other locations I’d be resistant to it). There was also talk about controlling some of the turns from driveways or 11th Street there, as drivers may be looking one way while pedestrians are crossing where they’re not looking. Construction should be starting soon with projected completion in early 2019. We then received a report from staff concerning transit stop accessibility. New Westminster’s goal is to have 100% of the bus stops in the city be accessible, where feasible and where bus ramps are deployable. Because of New Westminster’s topography, 98% of the bus stops in the city have the potential to be accessible. In 2006 52% of the city’s bus stops were accessible, and in 2017 that percentage has risen to 94%, which is the highest percentage of all the cities in Metro Vancouver. But it’s not good enough! There are still 9 bus stops in New Westminster that have the potential to be made accessible. Coast Mountain Bus Company has approved funding of $11,250 to go towards the city’s 2018 Accessible Transit Stop program, which means four more transit stops can be made accessible in 2018. There are two along Ewen Avenue, one on 6th Street (stop 52421 at 5th Avenue, serviced by the 106) and one on Richmond Street (stop 53616 at the graveyard, serviced by the 155). These four will bring New Westminster’s bus stop accessibility up to 96% with five stops remaining. There was a report about spot improvements to the Brunette Fraser Regional Greenway, particularly in the industrial section east of Sapperton. Go check it out in the agenda for all the details! Then came a report and discussion about the overpass going in over Stewardson Way near Grimston Park, a long-standing issue for nearby residents since the Queensborough Bridge connections were “improved” for vehicles. The new multi-use bridge should be started soon with the completion in March 2019. The bridge spurred discussion about the BC Parkway, which this bridge will tie into and potentially cause more foot and bicycle traffic on. There’s a section of the BC Parkway along Stewardson Way that’s incomplete between 5th Avenue and 14th Street. There used to be a gravel path on property owned by Southern Rail Yards but they fenced it off due to liability concerns, forcing pedestrians and cyclists to share a sidewalk directly adjacent to Stewardson Way. City staff has been in discussions with SRY to re-open the gravel path by offering various concessions (assuming liability, using city funds to pave it, etc) but SRY is very resistant to these improvements. ACTBiPed passed a motion to advise council to direct staff to keep up the pressure on SRY and hopefully come to an agreement that will make pedestrians and cyclists safer along this stretch of the BC Parkway. And that was our September 19th meeting! Finally, a much-belated report from the ACTBiPed meeting on February 7, 2018! The goal of the ACTBiPed committee is to help integrate walking, cycling and transit use into the transportation system that is balanced among all users and supports a socially equitable, economically viable and environmentally friendly city. The committee will review, advise and make recommendations to Council on policies, issues, facilities and programs regarding walking, cycling, and transit use. We held our first meeting of 2018 back in February, and you can go check out the agenda package if you so choose! After getting sworn in and becoming an official committee, we received an update on the rezoning application for 118 Royal Avenue. The gist of the update was that not much has happened from an active transportation point-of-view, and sadly the recommendation from the Land Use Planning Committee and city staff was to not have a multi-use path go between the property and the fields of Qayqayt Elementary. Instead the city will wait an undetermined amount of time for the adjoining two properties to be redeveloped and then create a multi-use path along busy Royal Avenue to Windsor Street. We then had an update on a push to modernize BC’s Motor Vehicle Act. Back in November we received a presentation from a representative of the Road Safety Law Reform Group on updating the MVA for modern times, after which we sent a recommendation to council to have them sponsor a resolution to the Union of BC Municipalities in support of this push. Good news everybody! Council voted to do just that! I’m really happy to see ACTBiPed pushing for safer roads for everybody who uses them, and making recommendations to council to make that happen. In July, the New Westminster Museum and Archives will open the People Gotta Move exhibition down at the Anvil Centre. It’s going to focus on transportation issues in New Westminster and how they’ve impacted our neighbourhoods, industry and business. They’re working with the Vancouver LEGO Club to have models built of the city showing transportation through the ages. It should be a great exhibition, so get on down there and check it out between July and November! We got a chance to weigh in a little bit on the city’s transportation department’s work plan for 2018. I don’t have a lot of details because my notes have mysteriously gone missing, but one thing I do remember is this year they’re going to be tackling the section of the Central Valley Greenway between Cumberland Street and Debeck Street on East Columbia. Hooray! To help improve accessibility, the city will be building longer gangways at each terminal which allows for a more accessible slope for a portion of the day. Tides play havoc with this, so they will post predicted gangway slopes on the city’s website and at each terminal to help people plan their journeys. There will also be a shelter at the Port Royal terminal. Operating hours are going to expand to be 7:00 am to 8:00 pm from Monday to Thursday, 7:00 am to 9:00 pm on Fridays, and 9:00 am to 9:00 pm on weekends and holidays. The ferry will depart every twenty minutes. Fares will be $4 for adults and $2 for children and seniors, and you’ll be able to buy a book of ten tickets for $15 and $7.50, respectively, or a one month pass for $30 and $15, respectively. And that was about it for the first ACTBiPed meeting of 2018! Our official ACTBiPed meeting for October 18, 2017 was cancelled and replaced with a projects sub-committee meeting. Some people (myself included!) like to get into the details of transportation system designs, so to keep regular meetings from getting bogged down, we have these sub-committee meetings. At the October 18, 2017 meeting we took a dive into the active transportation designs for the proposed Sapperton Green community. Sapperton Green will have two new streets, an extension of Wilson Street, and a pile of pedestrian and cycling infrastructure in it. Its proximity to the Braid Street SkyTrain station will hopefully mean that there will be greater uptake of active transportation modes by residents living there. The development of the area will also make connections from other neighbourhoods to Braid easier. At least, that’s the plan. They’ve designed pathways to have a grade no higher than 4.9%, which is very important for people with mobility difficulties. The site is challenging in that there is a definite slope, especially at Wilson Street, which is why they’ve put in a bit of a switchback system leading towards Rousseau Street. Think of the sidewalk switchbacks at the bottom of Elliot Street and that’s what they’ll be like. The PDF (linked below) has further detail on this section. We did get a chance to look at the more detailed designs, and some of them have some interesting ideas. In this close-up of the intersection of Rousseau Street and what they’re calling “Transit Way”, there’s a subtle detail that escaped me and most of the other people at the table, and that’s that the top lane of Transit Way is actually a through lane. The orange-coloured area to the left is actually a driveway entrance. The designers said they wanted to recreate the “Granville Island feeling”, which surprised a lot of people at the table. As a pedestrian on Granville Island I spend most of the time hating how poor the pedestrian environment is and thinking cars should just be banned from it altogether. Trying to recreate that in a new environment is… weird. The right turn off Rousseau is also softened like that for buses, in case you’re wondering. That close-up also shows the thoughts for the multi-use paths. They’ll be separated from the street network but will still mix pedestrians and cyclists, and will be 4 meters wide. The next close-up is the intersection of Transit Way and “Road B”, which is roughly half-way between Rousseau and the Braid bus loop. It brings up a couple of points that we made during the presentation. First, they should use raised crosswalks wherever they can. This puts pedestrians and cyclists first, and helps to slow vehicle traffic. The designers said this was a bit of a challenge on Transit Way because TransLink doesn’t like bumps, but they’ll consider it for all of the other streets, particularly ones that are crossed by multi-use pathways like this one. Second, the lanes on Road B (and Road A, check the PDF linked below for where that is) are actually wider than the lanes on Transit Way, which we found bizarre. Roads A and B don’t have multi-use paths on them so cyclists would be expected to cycle in the street (yay sharrows!). Widening the lanes means vehicles will be compelled to drive faster, and having faster vehicles mixed with bicycles is just plain crazy. We have a chance to properly engineer slower streets here, and the designers had better do it. Of course, a major part of Sapperton Green runs along the Brunette River, and includes part of the Brunette-Fraser Regional Greenway. They’re planning some pretty great improvements to the whole stretch, and these improvements include moving the BFRG away from the naturalized zone that parts of it currently go through. This will help improve the whole riparian zone along the Brunette River, which is definitely a good thing. There are a lot of other interesting ideas going on in this development, like an adventure park, a community centre, retail facing multi-use paths to hopefully spur patio use, and intriguing public art concepts around the SkyTrain station. If you’re at all interested in learning more about Sapperton Green, please do follow the city’s webpage. I’m also making the slides from the presentation made to ACTBiPed available so you can take a closer look at the designs and streetscapes they’re proposing for this exciting new development! Okay, this report is three weeks late. Sorry! At the September 20, 2017 ACTBiPed meeting we talked mainly about snow and ice removal and a development on Royal Avenue that could have seen improvements to multi-use paths near Qayqayt Elementary but won’t. Let’s go! First, snow and ice removal. Last winter was pretty brutal on the Lower Mainland, and it was especially brutal for people who rely on safe access to sidewalks to get around. There are already bylaws on the books for getting residents and businesses to clear their sidewalks, but those bylaws are slow to be enforced, and they have issues. What happens for residents that are physically incapable of clearing their sidewalks? Not everybody can rely on a nice neighbour to help them out. Further, there are large gaps in the snow removal plan that have bad repercussions on pedestrians. Take lanes as an example. They’re very low on the city’s priority list for being plowed. But sidewalks cross lanes, and if a lane doesn’t get plowed then the part of the lane that the sidewalk crosses doesn’t get cleared, which is a poor result for pedestrians. Whose responsibility is it to clear these paths? It’s city property so the city should, but at what priority? The city has updated their snow and ice removal plan, and council has directed staff to prioritize pedestrian safety, which is pretty much what we advised council to do. The city is also going to be improving its communications around residents’ responsibility for snow and ice removal. I suggested that it might become a Metro Vancouver communications issue, given most municipalities have similar bylaws and issues around snow and ice removal, but honestly I’d be surprised if that happened. Honestly, there’s more communication about watering your lawn than there is clearing your sidewalk, and given the latter is a safety issue, that balance seems all wrong to me. We received a report on a rezoning application for 118 Royal Avenue. Normally we wouldn’t receive reports on rezoning applications, but in 2015 and 2016 ACTBiPed committee members identified this section of Royal Avenue as being a potential connection for a multi-use path, and the properties along that route were flagged within the city’s GIS system for provision of a multi-use path upon receiving a rezoning application. The proposed land use for this site will have multiple townhouses instead of the single family house currently on the lot. Unfortunately because of economic considerations, the developer wasn’t willing to give up a part of the front of the lot to allow the city to widen the existing sidewalk into a multi-use path that would connect to the existing path along the north side of Qayqayt Elementary. This section of New Westminster has been a bit of a disappointment for multi-use paths. It’s disappointing that one wasn’t built into the east side of Qayqayt Elementary to lead down from Royal Avenue to Cunningham Street, and then to the future Agnes Street Greenway. This, in my opinion, partly falls on the school district, as they seem to talk the talk about promoting cycling and walking to school to make healthier children, but don’t walk the walk when it comes time to actually put improvements into place that would enable this. There was a similar lack of will when we were talking about a multi-use path through a part of the Fraser River Middle School grounds leading from Ninth Street to the corner of Royal Avenue and Eighth Street. Our next meeting is October 18, and hopefully I’ll have a quicker turnaround time for putting up my report! Sorry this one’s a little late, everybody! The May 3 ACTBiPed meeting had a bunch of interesting items, including reports from staff about new 30 km/h zones, a new bike lane for the Brunette Fraser Regional Greenway, and the first steps on the Connaught Heights Traffic Calming Plan. Let’s go! The Motor Vehicle Act forbids municipalities from enacting a blanket speed limit for all streets within their boundaries. Every residential street must have a speed limit of 50 km/h unless directed otherwise. “Directed otherwise” means that if you’re going to impose a speed limit other than 50 km/h, every chunk of street between intersections needs to have a sign stating what the changed speed limit is. This is for enforcement reasons — if you enter a street with a 30 km/h limit but do not pass a sign stating that, the police have no grounds to give you a speeding ticket as you weren’t “directed otherwise”, you were going the 50 km/h limit the MVA says applies. Signs cost about $150 to purchase and install. Pedestrians have a 90% chance of survival in a pedestrian/vehicle collision when the vehicle is travelling at 30 km/h. They have a 15% chance of survival if the vehicle is travelling at 50 km/h. The city is going to start a pilot project along the upgraded Rotary Crosstown Greenway, and then design the 6th Street “Great Street” such that the engineering design lends itself to a 30 km/h limit, and then also continue the project into 2018 along all greenways, bikeways, and streets where it’s illegal to cycle on the sidewalk, approximately 15km of streets. A rough order of magnitude calculation puts the cost of installing all of these signs to be about $22,500 (about 150 signs at about $150 each). This project is just a pilot project, and can be made permanent with Council’s support. If you want a 30 km/h limit on New Westminster’s streets, write to Council! The city will soon be enacting a Downtown Strategic Transportation Plan, including such hot topics as traffic calming, bicycle networks (including the Agnes Street Greenway!) and dealing with all of the new developments in progress and in the plans. Look for more information on this in fall 2017. We received an update on the Connaught Heights Traffic Calming Plan. Not much to report here other than some “quick wins”: new sidewalks along 21st Street between 7th and 9th Avenues and along 8th Avenue between 22nd Street and a bus stop mid-block, and traffic circles at the intersections of 21st Avenue and Edinburgh Street and 21st Avenue and London Street. Don’t worry, Connaught Heights residents, more is coming! There’s a workshop coming up on June 15th at the Connaught Heights Elementary gym at 6pm. Go check it out! Watch for construction to start later this year and for it to be substantially complete before year-end. Andrew Feltham (an ACTBiPed member) gave a presentation on transit priorities, with a bit of a focus on Queensborough. Transit priorities are things like bus lanes or bus-only traffic signals, like the one at the south end of 20th Street to get onto the Queensborough Bridge. If you can think of any areas that could benefit from transit priorities, shoot me a comment below! There’s a new draft bike route map out too. We had some comments about it (like why in the world would staff remove Columbia & McBride from the “Caution! Extra Care Needed” category?!?) and they’ll be revising the map accordingly. Next ACTBiPed meeting is scheduled for June 7 at 6:30pm at New Westminster City Hall. As always, it’s open to the public. Another month, another ACTBiPed meeting. At March 8’s meeting we got to talk about pedestrians and accessibility, bus shelters, cycling, and a neighbourhood transportation plan. Let’s go! First up was a report from a city planner about a pedestrian and cycling overpass at Sixth Street over Front Street and the train tracks to connect with Pier Park. This doesn’t seem to be a critical piece of infrastructure to put in right now, but the construction at 660 Quayside Drive is going to close the entrance to Pier Park along the waterfront, leaving the only access at the 4th Street elevator and stairs. City staff were asking for comments from ACTBiPed on whether this overpass should include an elevator or be an accessible ramp. Overwhelmingly the response was an accessible ramp. I think (and with good reason) people in New Westminster are hesitant to recommend outdoor elevators, and an accessible ramp means people with mobility issues (or cyclists) can get to and from Pier Park at any time. Look for this overpass to be in place hopefully before construction at 660 Quayside starts in Spring 2018. If you have suggestions on where bus shelters might be needed, please do let the city know! Also, if you have any suggestions on providing shelter at the Police Station stop on Sixth Street, let the city know as well! After the bus shelter report came a report about the ‘listen and learn’ workshop held in Sapperton as one of the initial stages for the development of the Sapperton Transportation Plan. Given the report was largely based on input from the community, there were some… interesting ideas that won’t actually see the light of day (like the Stormont Connector). The report gave good insight into what Sapperton residents see as important in their neighbourhood. From a cycling point-of-view, the gap in the Central Valley Greenway between Cumberland and Brunette was noted as a huge deficiency, and there’s also some talk towards making Keary Street the official bike route between Columbia and Richmond instead of Sherbrooke Street. Days are still early, so if you have any interest in transportation in Sapperton (and most importantly, pedestrian transportation) definitely follow the city’s news. The next workshop is scheduled for April 8, 2017. We then got an update on the public consultation for the Rotary Crosstown Greenway improvements. About a dozen people showed up, and the response was largely positive. 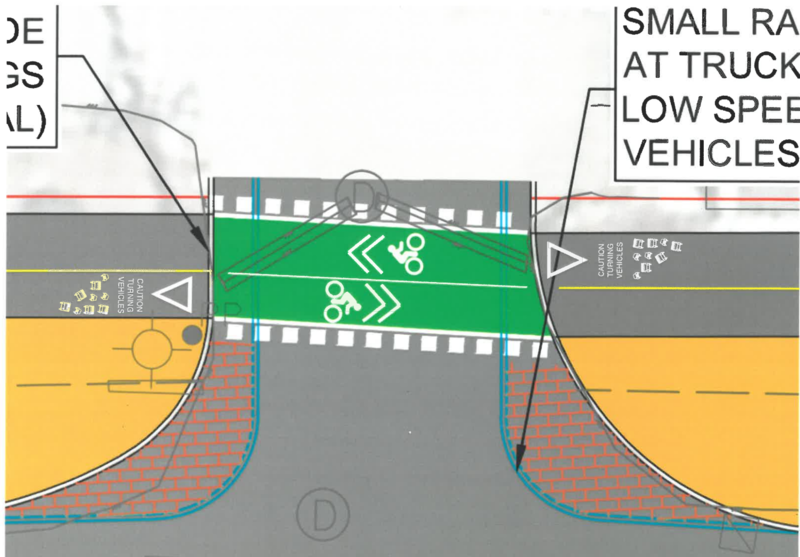 Some people thought that the plans don’t go far enough and the bike lanes should be properly separated with curbs! Look for paint to go down on the street sometime this summer. It’ll be New Westminster’s first AAA (all ages and abilities) walking and cycling path! And to finish things off, Mary Wilson announced the Walk New West Challenge that’s happening from April 3 to May 28. Form a team, register, and discover just how walkable New Westminster is! I’m a member of New Westminster’s Advisory Committee for Transit, Bicycles and Pedestrians (aka ACTBiPed), and we had our first meeting of the year on February 2017. Since they’re open to the public and only one member of the public routinely attends (the always awesome Mary Wilson), I’ve decided to post a little report after each meeting outlining the things that we do and learn in these meetings to help shed some light on the City’s efforts to make sustainable modes of transportation safer and more appealing. Because last night was the first one of the year, we had to deal with the administrivia first: Oath of Office, don’t be a jerk, that sort of thing. Did you know that as a member of an advisory committee I’m not allowed to take bribes? Shocking, I know! Increase safety so that there will be no traffic-related fatalities or serious injuries most years. Design of the Braid section of the Brunette-Fraser Regional Greenway. We endorsed this work plan, and I’m looking forward to seeing more details on a number of these items. We then received a report from Engineering Services about the 2017 Pedestrian Crossing Improvement Program. The first thing to note about this is that the budget of $250,000 for this program has not yet been approved by council, so it’s subject to change. Engineering Services has identified 9 locations in the city that would benefit from some sort of improvements to make crossing the street safer for pedestrians. The procedure to identify these locations is a little complicated, involving vehicle traffic counts, pedestrian traffic counts, vehicle speeds, distance from another control device, number of collisions, and the demographics of pedestrians in the area (is it on a Safe Route to School, are there a significant number of vulnerable pedestrians such as seniors or people with disabilities, and so on). They also use these statistics to determine what kind of improvements are warranted — it makes no sense to put a pedestrian activated traffic signal on a quiet street with very few pedestrians. Install a curb extension, a zebra crossing and pedestrian crossing signs at Carnarvon Street at Lorne Street. Install pedestrian-activated traffic signal and consider improvements to shopping center parking lot at Royal Avenue at Eleventh Street. Judging from the discussion around the table, the last one is going to be a little controversial. It’s fairly close to the pedestrian crossing at Royal Avenue and Stewardson Way, and there isn’t a lot of pedestrian traffic at Royal and Eleventh. It has a lot of vehicle traffic, and that vehicle traffic is moving quickly (67.5km/h in a 50km/h zone). But importantly, of all the crossings analyzed this crossing had the second-highest number of collisions, and even worse, it had a pedestrian collision. Pedestrians surveyed say they do not feel safe at the Royal/Stewardson crossing, and this crossing would make pedestrians feel and be safer crossing Royal at Eleventh. We endorsed the 2017 Pedestrian Crossing Improvement Program, and since that was the last item on the agenda, we wrapped up the meeting.